Flash File Recovery is an easy-to-use and powerful image recovery software designed exclusively for digital camera users. 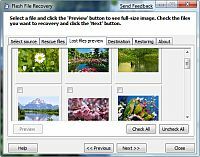 Flash File Recovery recovers deleted, formatted and lost digital photos, images and pictures from almost any types of media cards used by digital cameras. If images were deleted or formatted in a digital camera or a computer, or if the media is corrupted and not recognized by Windows, Flash File Recovery can find lost images back for you. Recover professional digital camera raw picture formats like Canon crw recovery, Nikon nef recovery, Minolta mrw recovery, Sigma Sigma Foveon X3 raw picture x3f recovery, Leika Panasonic Contax picture raw recovery, Fujifilm raf recovery and so on.